The final release of the year for the 24 karat gold coin series honoring the First Ladies will be the Lucretia Garfield First Spouse Gold Coin. The estimated release date is December 1, 2011, although this will remain subject to potential change. 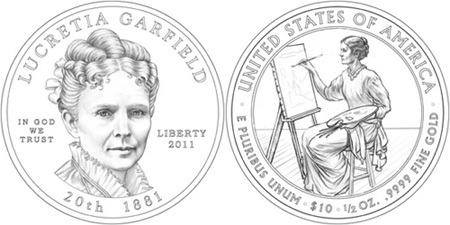 A portrait of Lucretia Garfield appears on the obverse of the coin, which was designed by Barbara Fox and sculpted by Phebe Hemphill. Inscriptions include her name, “In God We Trust”, “Liberty”, “20th”, “1881”, and “2011”. She had served as First Lady for only a brief time before her husband was shot and struggled for his life for three months before passing. The reverse of the coin is intended to represent Lucretia Garfield’s interest in art, with an image of her seated before a canvas with palette and brush. The surrounding inscriptions include “United States of America”, “E Pluribus Unum”, “$10″, and “1/2 oz. .9999 fine gold”. The reverse was designed and sculpted by Michael Gaudioso. First Spouse Gold Coins typically carry a specified maximum mintage, which is announced prior to the start of sales. The coins remain available from the United States Mint until the maximum mintage has been sold or for approximately one year. Pricing for the coins is determined based on the average price of gold, and may be adjusted weekly.